October 23, 2018-A 28-year-old woman who lives in Jamaica, Queens helped lead the island of Jamaica to qualify for the Women’s World Cup final, becoming the first Caribbean nation ever to do so. Nicole McClure is eligible to play for the Reggae Girlz as both her parents are Jamaican. In the CONCACAF Women’s Championships, Nicole played one game in the group stage, a 9-0 shutout of Cuba. In the third-place match last Wednesday against Panama with the winner automatically qualifying for the Women’s World Cup, the score was knotted at 2-2 in the 120th minute when Nicole was brought on for the shootout, replacing current UNC Wilmington goalkeeper Sydney Schneider in goal. 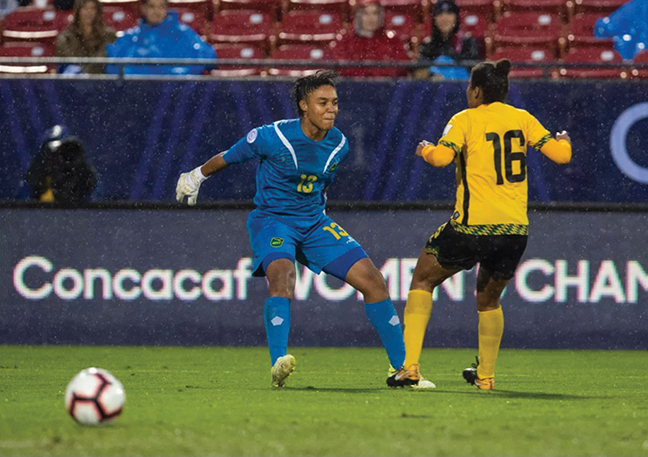 Nicole saved penalty kicks from Panama's Lineth Cedeno and Kenia Rangel while Jamaica converted all four of their shots to send the Reggae Girlz to the Women’s World Cup. She grew up playing in the Long Island Junior Soccer League (LIJSL) for the Auburndale Strikers from 1998 to 2003 and the East Meadow Shooting Stars from 2003 to ’07. With the Shooting Stars, she won the Eastern New York Youth Soccer Association (ENYYSA) Girls-Under-15 State Open Cup final in 2005. Nicole also played for Eastern New York’s Olympic Development Program (ODP). After playing and studying at the University of Hawaii and the University of South Florida, Nicole has travelled around the world as a professional soccer player. There have been stops in Iceland (UMF Selfoss in 2012 and HK-Vikingur in 2013), Switzerland (FC Neunkirch in 2013), Norway (Klepp Elite in 2015), Israel (Ramat Hasharon in 2015-16), France (ETG Ambilly in 2016-17), Croatia (Split in 2017) plus Sweden (Ostersunds DFF in 2014 and her current club team, Sundsvall DFF). Nicole flew back to Sweden last Thursday for her Saturday game. When she walked into the locker room Friday, her teammates applauded and surprised her with a cake adorned with the Jamaica flag that read, “Congratulations, Nicole” in Swedish with Bob Marley music blasting.